Just bought a licence and downloaded the Fence-installer from HumbleBundle. How do I get Fence to work properly and how to finally register it? 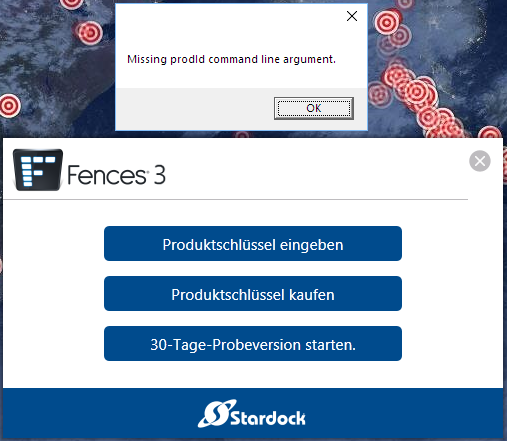 Sadly my problem is not concering my serial number but more this error message, that shows as soon as Fences is running, and the fact that the "Stardock"-windows with the link "enter serial number" is not working. Enter serial key: error message comes up, no possibility to enter serial. Same with 30 day trail. Only buy key brings me to the website - without error message. Any ideas how finally fix this - if not I will try to cancel my purchase, as it seems it will not work on my PC. Thanks for your tips and the links. Finally, I give up. Extra account: error message. Clean boot: error message. With all this testing and "cleaning" I found out that I had installed some weeks ago the 30 days trail, which got uninstalled while Win 10 Upgrade 1803 performed some further updates. Maybe there's an easy solution if someone already hat Fences as trail installed? If not, I'll give up and retry with the next Microsoft Update. I spent so much time on several possible solutions and not a single one worked - maybe the error within my OS will be "cleaned" with MS next upgrade.